Greenpeace New Zealand's new political advisor, Geoff Keey is one of this country's most influential environmental activists. At Canterbury University in the early '00s Keey was active in the Student Christian Movement, which despite its name is a leftist politico-religious organisation. In Christchurch Keey worked to implement the UN backed Agenda 21, promoting the edicts of the 1992 Rio Earth Summit. He also worked as a media worker for Christchurch Labour MP Tim Barnett. In 2002, while bio-security officer for Forest&Bird, Keey represented the SCM at the Johannesburg Earth Summit. While kept fairly quiet, Geoff Keey has in recent years been an active supporter of the Save Happy Valley Coalition. His role is believed to have been mainly been advisory, but it would have almost certainly brought him into contact with some of the several "Urewera 17" arrestees active inside SHVC. Geoff Keey is now at least the fourth SHVC activist, after Kristin Gillies, Jo McVeagh and Raoni Hammer to get a job with Greenpeace New Zealand. Cosy little world, the environmental movement. good heavens! There certainly is something sinister going on. Not! who else was at the earth summit? 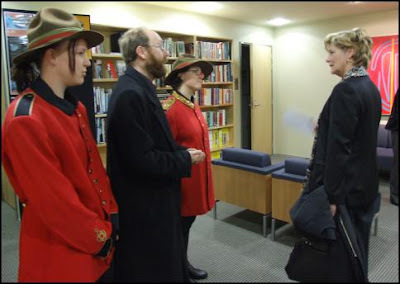 surely someone who once went to a meeting where a real live communist was present? or maybe Geoff Keey once had a cup of coffee in the same cafe as someone who once visited Mexico . .
Oh MY GOD! An environmentalist from Forest and Bird gets a job at Greenpeace! He supports a group opposing a coal mine that threatens forest, and birds, and snails! He worked for Tim Barnett! He was member of a Christian social organisation! Someone should be locked up if these obscene allegations are true. These Greenpeace profiles have become a bit ridiculous. I still fail to see how I am relevant to a profile about the life of Jo McVeagh considering I have only met her in passing. You mentioned me twice! One wanting to write a proper profile might go and interview people the subject knows or even the subject herself. However, that would take proper research and time. As Trev is rather lazy he just googles names and then adds all the other names that pop up. He then writes like he has some sort of secret inside information. In several of my courses at university the lecturer has greatly stressed why google searches are not a substitute for proper research. Who is this Zuma fellow in SA Trevor? It's nice someone is showing Greenpeace's strong left-wing leanings. The Lefties have taken over scores of environmental and social organisations just as they once concentrated on taking over worker unions. Greenpeace is just one of many. You can even find their fingers now in groups like Barnardo's. While everyone else is busy working and raising families they have time on their hands to meddle, subvert, and control.